In the years preceding the Great Recession there was a dramatic rise in household debt in the US, and an increase in import competition triggered by the expansion of China and other low-wage countries. This column uses consumer credit data to argue that these phenomena are intimately linked. Household debt levels increased significantly in counties where US manufacturing jobs shifted overseas, and regional exposure to import competition explains 30% of the cross-regional variation in the growth in household debt. 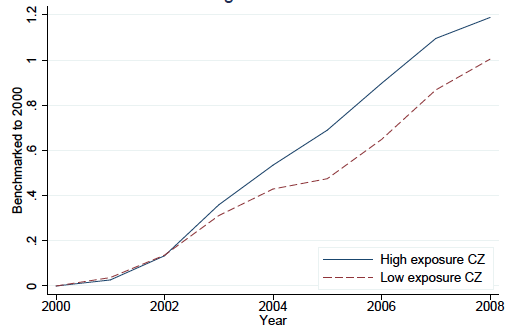 In the years preceding the Great Recession, there was a dramatic rise in household debt (e.g. Mian and Sufi 2009) and an unprecedented increase in import competition. This competition was triggered by the expansion of China and other low-wage countries in global markets, and had substantial labour market consequences (Autor et al. 2013, Autor et al. 2014, Pierce and Schott, 2016). There is a striking break and a dramatic acceleration of both trends at the turn of the century. We hypothesise that these two phenomena were intimately linked, and that the impact of import competition on labour markets affected household debt expansion from 2000 to 2007. More precisely, we argue that the displacement of domestic production by imports fuelled demand for credit in impacted areas. We examine this hypothesis using a large, nationally representative panel dataset of anonymous consumer credit records, the Federal Reserve Bank of New York's Consumer Credit Panel/Equifax Data (CCP), HMDA as well as a longitudinal survey, the PSID. We exploit cross-regional variation in exposure to import competition to study the impact of import penetration on household liabilities. More precisely, we use variation in exposure to international trade driven by historical industry composition at the commuting-zone level. To capture exposure to import competition, we build on prior work (Barrot et al. 2016) and use industry-level shipping costs (SC), obtained from import data and computed as the mark-up of Cost-Insurance-Freight over the price paid by the importer. We find shipping costs to be a strong predictor of the increase in import penetration. 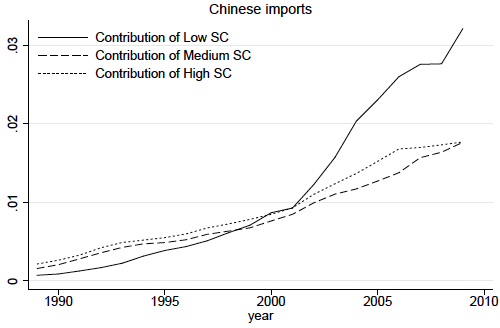 In Figure 1 we decompose Chinese import penetration to the US into high, medium, and low shipping cost industries. Most of the dramatic increase in Chinese import penetration in the 2000s is concentrated in low-shipping-cost industries. We compute a weighted average measure of shipping costs for each commuting zone based on its 1998 distribution of employment across sectors to capture regional exposure to import penetration. We then confirm the adverse effect of international trade competition on local labour markets (Autor et al. 2013). Exposed commuting zones experienced higher unemployment growth from 2000 to 2007 than commuting zones with high shipping cost industries. A one standard deviation increase in shipping costs explained 20% of the cross-sectional standard deviation in unemployment growth in this period. We test whether commuting zone exposure to low shipping cost industries caused an increase in household leverage. Figure 2 illustrates our main finding. It shows total debt growth across regions with high and low exposure to import competition from 2000 to 2007, relative to the level in 2000. While debt increases by more than 100% in both groups, it grows by an additional 20 percentage points for exposed areas over the sample period (Panel A). Panel B replicates this exercise with debt-to-income ratios, obtained after scaling total debt by income. It shows the same pattern. Leverage increases significantly more in exposed areas in the run-up to the crisis. We find that a one standard deviation in shipping costs is associated with a 5.7% increase in aggregate household debt and debt-to-income. This was 30% of the cross-commuting zone variation in household debt growth from 2000 to 2007. We compare this with the correlation of house price appreciation on household debt, another determinant of household debt (Mian and Sufi 2011) and find them to be of comparable magnitude. Finally, we study how the effects vary across types of household borrowing. The increases were concentrated in mortgage refinancing loans and credit card debt. We don’t find any significant effect of exposure to import competition on auto debt or mortgages for new home purchases. This is consistent with households using debt to smooth or sustain consumption, rather than buying more durable goods. The increase in debt we capture at the commuting-zone level might not have resulted from active levering up, but rather by migration patterns across differentially exposed areas. Therefore, using the CCP data, we confirm that our baseline results hold at the individual level. We exploit the richness of this data to compare exposure to import competition with the level of price appreciation. We hypothesise that the ability of exposed workers to react to labour income shocks with debt should be larger in areas where house prices appreciated. This is the case. Households in exposed areas where prices have appreciated were more likely to extract home equity by increasing mortgage borrowing. We examine the aftermath of this increase in leverage during the Great Recession of 2008-2010. Using individual-level data, we find worse outcomes during the crisis for households located in regions that were more exposed to import penetration. In textbooks, the life-cycle consumer uses debt to smooth consumption when income shocks are transitory, but the displacement of US manufacturing jobs induced by Chinese import penetration seems long-lasting. So why is household debt sensitive to import competition? The fact that exposed households reacted to this shock by taking on more debt would be consistent with many hypotheses. Debt growth might have been concentrated among workers for whom the shock was effectively transitory, namely, those with higher education backgrounds who were able to switch to less exposed industries. Alternatively, although the displacement effect of import penetration seems permanent in hindsight, it might have initially been perceived as transitory. This led workers to borrow to smooth consumption. Credit demand may also have been driven by ratchet effects in consumption. In this case affected households increased their credit demand to maintain consumption levels, even if the shock was perceived as being long-lasting. This research underscores an important, yet overlooked, driver of the dramatic increase in household debt in the 2000s. Two phenomena that impacted the US economy in the years preceding the Great Recession – the dramatic rise in household debt; and the unprecedented increase in import competition, triggered by the expansion of China and other low-wage countries in global markets – are, in fact, intimately linked. Authors’ note: The views expressed are those of the authors and do not necessarily reflect the position of the Federal Reserve Bank of New York or The Federal Reserve System. Autor, D H, D Dorn and G H Hanson (2013), “The China Syndrome: Local Labor Market Effects of Import Competition in the United States," American Economic Review, 103 (6), 2121-68. 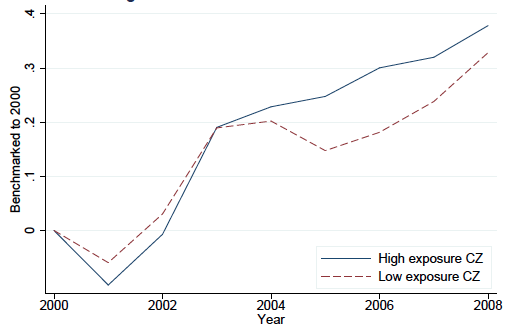 Barrot, J-N, E Loualiche, and J Sauvagnat (2016), “The Globalization Risk Premium," MIT Sloan Working Paper. Barrot, Barrot, J-N, E Loualiche, M Plosser and J Sauvagnat (2106), “Import Competition and Household Debt," MIT Sloan Working Paper. Mian, A and A Sufi (2009), “The Consequences of Mortgage Credit Expansion: Evidence from the US Mortgage Default Crisis," The Quarterly Journal of Economics, 124 (4), 1449-1496. Mian, A and A Sufi (2011), “House Prices, Home Equity-Based Borrowing, and the US Household Leverage Crisis," American Economic Review, 101 (5), 2132-56. Pierce, J R and P K Schott (2016), “The Surprisingly Swift Decline of US Manufacturing Employment," American Economic Review, 106 (7), 1632-62.